As I noted in my prior post, yesterday, the State filed its Brief of Petitioner to the Court of Appeals of Maryland in the Adnan Syed case. That brief was accompanied by an Appendix of supporting documents. The State's Brief includes the following "Question Presented" to the Court of Appeals: "Did the Court of Special Appeals err in holding that defense counsel pursuing an alibi strategy without speaking to one specific potential witness violates the Sixth Amendment’s guarantee of effective assistance of counsel? " So, what was that strategy? At trial Gutierrez affirmatively pursued an alibi defense through cross-examination of witnesses presented by the State (See, e.g., T. 2/4/00 at 97-100; T. 2/3/00 at 88-133), by substantiating a reliable routine that Syed followed every day, i.e., attendance at school followed by track practice followed by services at the mosque (T. 2/23/00 at 79-81, 100-04, 274-75; T. 2/24/00 at 16-17, 116-17, 151, 185, 193-96), and by calling to testify Syed’s father, who asserted that on the evening of Lee’s disappearance he went to the mosque with his son at approximately 7:30 p.m. for an 8 p.m. prayer meeting (T. 2/24/00 at 16). The trial court agreed to give an alibi instruction to the jury, thus finding that an alibi defense had been generated by the facts established by Gutierrez at trial. (T. 2/25/00 at 32-33). T. 2/4/00 at 97-100: This is Gutierrez unsuccessfully trying to get Inez Butler to testify during cross-examination that Adnan had a routine of attending track practice. T. 2/3/00 at 88-133: This is Gutierrez cross-examining Yaser Ali about Adnan's regular attendance at the Mosque during Ramadan. T. 2/23/00 at 79-81: This is a bench conference during the testimony of Mr. S.
T. 2/23/00 at 100-04: This is Gutierrez getting Coach Sye to testify that Adnan regularly attending track practice from "[a]pproximately 4:00 to 5:30, 6." T. 2/23/00 at 274-75;T. 2/24/00 at 16-17: This is Gutierrez getting Adnan's father to testify that Adnan took him to the Mosque between 7:30 and 7:45 P.M. on January 13, 1999 for prayers that went from 8:00-10:00 P.M.
T. 2/24/00 at 116-17; 151: This is Gutierrez getting Saad Chaudry to testing that Adnan regularly attended the Mosque during Ramadan. T. 2/24/00 at 185: This is Gutierrez getting Saad P to testing that Adnan regularly attended the Mosque during Ramadan. T. 2/24/00 at 193-196: This is Gutierrez getting Maqbool P to testing that Adnan regularly attended the Mosque during Ramadan. (4) Gutierrez called a witnesses -- Adnan's father -- who testified that he went with Adnan to the mosque at about 7:30 P.M. on January 13th contradicting the State's claim that Adnan was in Leakin Park in the 7:00 P.M. hour, leading to the court giving an alibi instruction. 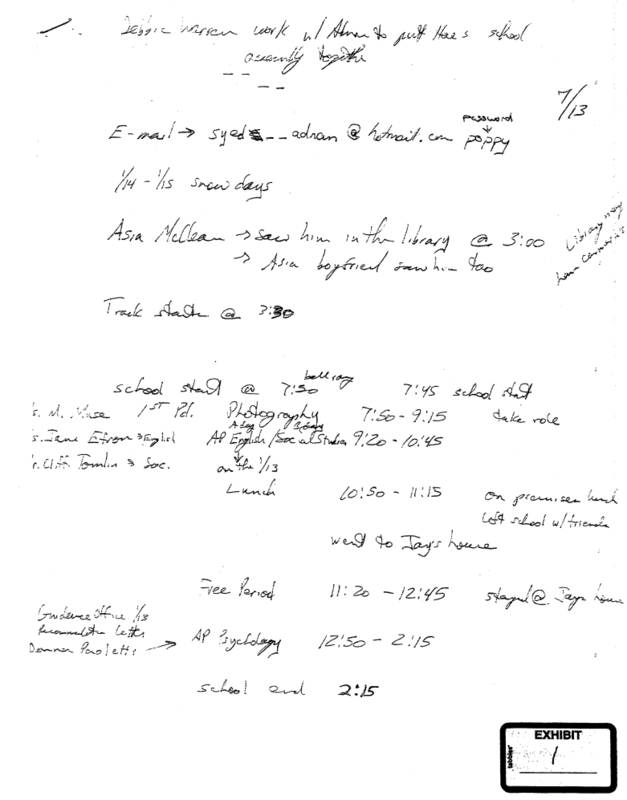 So, summing that all up, Gutierrez called/cross-examined no eyewitnesses to establish Adnan's routine whereabouts or whereabouts on January 13, 1999 until about 4:00 P.M. Two sets of notes in the defense file place Adnan's encounter with Asia McClain: (1) between 2:15 and 3:15 P.M.; and (2) at about 3:00 P.M. Of course, Asia would later (1) sign affidavits (first; second) stating that she saw Adnan between about 2:20 and 2:40 P.M.; and (2) give testimony about seeing Adnan between about 2:20 and 2:40 P.M. that Judge Welch deemed credible. In its brief, the State tries to make two points: (1) Gutierrez could have reasonably decided not to contact Asia because she would have contradicted the specific alibi defense presented at trial; and (2) Gutierrez could have reasonably decided not to contact Asia because Gutierrez "[g]iven the potential advantages of an alibi by routine, and the risks of a narrow alibi." The above citations prove the flaw in the first argument. Simply put, Gutierrez didn't present any evidence of Adnan's general or specific whereabouts until 4:00 P.M., which is about an hour after Gutierrez would have thought that Asia saw Adnan (and well after Hae had likely been killed). As for the second argument, as noted above, Gutierrez did present alibi evidence about Adnan's specific whereabouts on the night of January 13th through the alibi testimony of his father, which invalidates the claim that Gutierrez wanted to rely solely on an "alibi-by-routine." But, you might say, maybe she preferred an "alibi-by-routine" for the 2:00 P.M. hour to a specific alibi (even though she presented no routine evidence for this time period). But...we know that's not true. At trial 1, Gutierrez got Debbie to testify (pg. 338) that she had told the police she'd seen Adnan outside the guidance counselor's office at 2:45 P.M. on January 13, 1999. Then, at trial 2, Gutierrez unsuccessfully tried to get Debbie to testify again (pg. 114) that she had seen Adnan outside the guidance counselor's office at 2:45 P.M. on January 13, 1999. That's a specific alibi for January 13th, not an "alibi-by-routine," and it belies the State's claim that Gutierrez could have decided not to contact Asia because she preferred an "alibi-by-routine." Then, at trial 2, Gutierrez unsuccessfully tried to get Debbie to testify again (pg. 114) that she had seen Adnan outside the guidance counselor's office at 2:45 P.M. on January 13, 1999. So, Debbie says she saw Adnan at 2:45 pm, while he's in the library with Asia MacLean? Shandy: Four possibilities: (1) Adnan saw Asia in the library from about 2:20-2:40 P.M. and then Debbie outside the guidance counselor's office (which is <5 minutes away) at about 2:45 P.M.; (2) Adnan just saw Asia and Debbie has the wrong day; (3) Adnan just saw Debbie and Asia had the wrong day; or (4) both Asia and Debbie have the wrong day. I tend to with (2), but all are possibilities. Debbie’s testimony at Trial 1 is consistent with her police interview. It’s also consistent with the fact that Adnan had met with his counselor earlier in the day and that he had in his possession a letter of recommendation dated that same day. It makes sense that he stopped by to pick up a letter he’d requested earlier that day.